This British picnic favourite is said to have been invented by the London department store Fortnum & Mason in 1738. 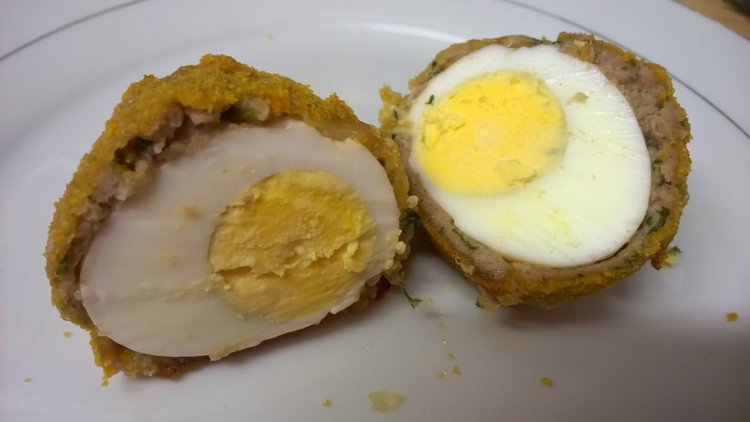 The humble scotch egg is a simple dish of boiled eggs covered in sausage meat and breadcrumbs and traditionally deep fried, but my version here is baked; you get enough grease from the sausage meat, no need to add more! They are usually eaten cold, but in my opinion are much nicer when freshly home made and eaten warm out of the oven, served with a salad. 1. Hard boil the eggs and allow to cool enough to handle. Peel them. 2. Finely chop the parsley and mix it into the sausage meat along with some black pepper. 3. Sprinkle the flour onto a plate and season with salt and pepper. Roll the eggs into the seasoned flour to lightly cover. 4. Divide the sausage meat mixture into 6, and flatten each piece out. 5. Wrap the flattened sausage meat around each egg, ensuring the egg is evenly and completely covered. 6. Roll each one in the beaten egg until covered, and then roll it in the breadcrumbs until covered. 7. Place on a baking tray and cook in a preheated oven 180C/350F for about 25 minutes. Note – you can cook them elevated from the tray on a rack if you want more of the fat from the sausages to drain away. Can be eaten hot, or cooled and then kept refrigerated to eat cold. I haven’t tried reheating them, but I probably wouldn’t recommend it. Hahaha, definite points for that. And we all have to splurge at times. Otherwise life would be no fun. Yes, very British! Although according to wikipedia they are regularly served at some state fairs and festivals in the US too. You could give them to Robbie, Neil won’t mind! Robbie would love them – go on, give him some! I’m not surprised to learn they might have found their way to an American state or county fair. They’re noted for deed-fried food – funnel cakes in particular, and even things like deep-fried Snickers bars and Twinkies (both of which sound gross to me!) OK, Neil, I’ll make a note and whenever I get around to working over MWFB, I’ll add some Scotch eggs! 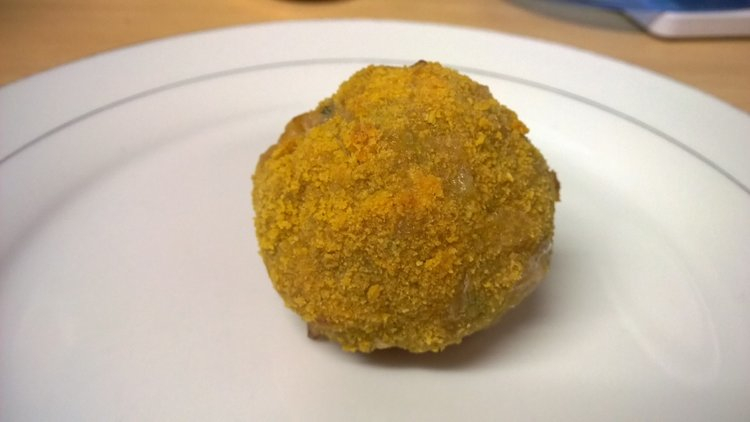 Yes, over hear Scotland is known for deep frying everything! Like Mars bars and even pizza slices! Yes, they can be variable! They are more often friend, but there’s really no need to do that, they come out better I think baked.